Nothing all that interesting ever really happens in High Wycombe, where Bryony Buckle lives with her cat Elton. She spends her days slaving away in a malfunctioning tax office, and swooning over her colleague Orson Bloom. That is until she notices an irregularity with one of the accounts. After reporting the irregularity to higher-ups, Bryony visits a quacky local doctor for a rather suspect vaccination, and is subsequently struck by lightning, which transforms into a super strong superhero. With the help of her work pal Poppy, Bryony dons a lycra costume and mask and becomes Vulvarine, the feminist superhero High Wycombe needs. She's got a lot of work to do, but little does she know she is being pursued by an evil scientist with a dastardly plan to bring down women around the world. The villain's name: The Mansplainer. 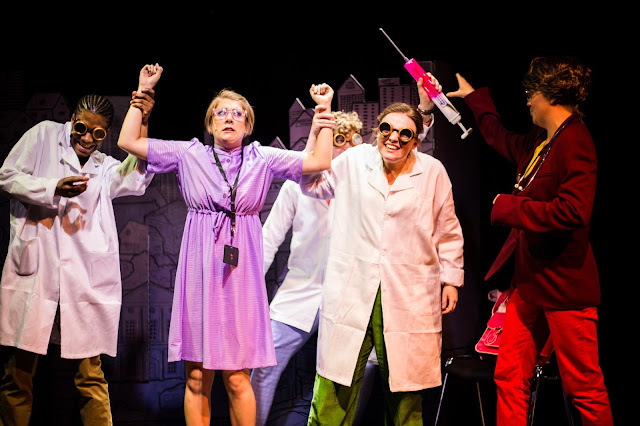 No theatre company does musical comedy quite like Fat Rascal Theatre, who's trademark combination of hilarious madcap jokes and relevant feminist messaging is unparalleled. Keeping the tone vigorously light throughout, despite the high stakes storyline, the book by Robyn Grant is a rollicking laugh-a-minute joyride, which combines some rude and crude bawdiness with more subtle jokes ("Is that your daughter?" Briony asks her doctor, gesturing at a picture. "No." the doctor replies briskly, leaving the audience to fill in the blanks for themselves). A sequence shortly after Briony gets her powers, which sees Vulvarine undertake her heroic duties by stopping manspreading on the bus, and dancing at a child's sparsely attended birthday party, elevates the plot, and from then on it never comes back down to earth. And Allie Munro is completely brilliant in the title role, channeling Bridget Jones, if she'd gotten her hands on a copy of Laura Bates' Everyday Sexism. The ensemble cast of Vulvarine perfectly channels the over the top tone of the musical, embracing all of its silliness, and pushing their melodramatic performances just far enough. They also sing up a storm. Memorably, The Mansplainer, who is obsessed with The Greatest Showman and infatuated with its star Hugh Jackman, shows off his own showmanship in a Disney Villain level bad guy song, performed by a gleefully maniacal Robyn Grant. Meanwhile Briony and Jamie Mawson's Orson sing a brilliant love duet whilst trapped inside invisible 'lazar cages' in The Mansplainer's lair. At a time when superheros have never been more popular, Vulvarine: A New Musical lovingly mocks all of the staple superhero movie tropes, and the machismo which underlines many of Marvel and DC's offerings, whilst spreading an important feminist message, wrapped in a script so perfectly bonkers that it's impossible not to love! This is one marvelous new musical which needs to be seen!